Dey Street Books, 9780062467003, 240pp. Abby Wambach has always pushed the limits of what is possible. At age seven she was put on the boys’ soccer team. At age thirty-five she would become the highest goal scorer—male or female—in the history of soccer, capturing the nation’s heart with her team’s 2015 World Cup Championship. Called an inspiration and “badass” by President Obama, Abby has become a fierce advocate for women’s rights and equal opportunity, pushing to translate the success of her team to the real world. As she reveals in this searching memoir, Abby’s professional success often masked her inner struggle to reconcile the various parts of herself: ferocious competitor, daughter, leader, wife. With stunning candor, Abby shares her inspiring and often brutal journey from girl in Rochester, New York, to world-class athlete. 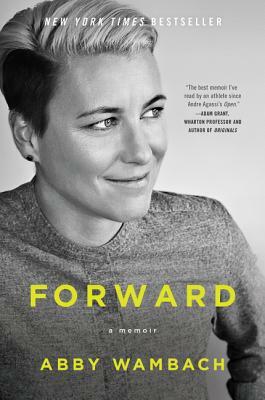 Far more than a sports memoir, Forward is gripping tale of resilience and redemption—and a reminder that heroism is, above all, about embracing life’s challenges with fearlessness and heart. Abby Wambach is an American soccer player, coach, two-time Olympic gold medalist, FIFA Women’s World Cup Champion, and the 2012 FIFA World Player of the Year. A six-time winner of the U.S. Soccer Athlete of the Year award, Wambach has been a regular on the U.S. women’s national soccer team since 2003, earning her first cap in 2001. She is the highest all-time scorer for the national team and holds the world record for international goals for both female and male soccer players, with 184 goals. Karen Abbott is the New York Times bestselling author of Sin in the Second City, American Rose, and, most recently, Liar Temptress Soldier Spy, named one of the best books of 2014 by Library Journal, the Christian Science Monitor, Amazon, and Flavorwire, and optioned by Sony for a miniseries. A native of Philadelphia, she now lives in New York City, where she's at work on her next book.